As USA citizens, when cruising into Europe (for instance on a Transatlantic Cruise), one thing to be aware of is the EU Immigration Inspection. It usually occurs at the first port of call. For our 2015 Transatlantic voyage aboard the Norwegian Star, we did not have to do it actually at Ponta Delgada, Azores (the first port of the cruise), but on the sea day before reaching Dover/London, a pair of British immigration officers were on board to stamp passports. We were a bit surprised to find that, however, we had to go through a separate EU (European Union) Immigration Inspection during the port of Amsterdam in Netherlands. I know for sure that if a similar situation arose in the future when inspection is taking place during the day at port, we would not be booking a tour with the cruise line. For your reference, this is the information sheet we were given the night before arrival to Amsterdam. I rearranged a paragraph from its original location to reduce confusion; many guests had though that they had to stay onboard for Immigration when it was only the guests who had to do so. As the port of Amsterdam, Netherlands is a part of EU and Schengen States; please note that there will be a MANDATORY EU Immigration Inspection for ALL GUESTS regardless of nationality, age or status. 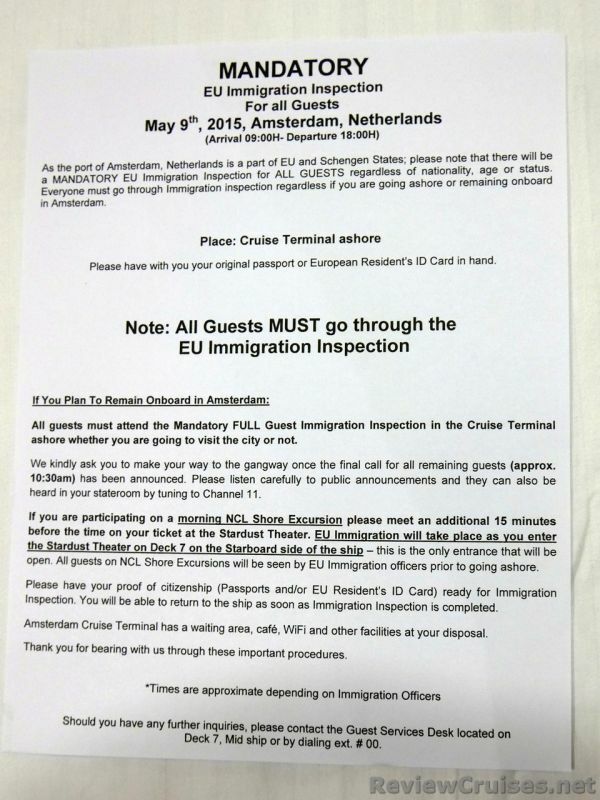 Everyone must go through Immigration inspection regardless if you are going ashore or remaining onboard in Amsterdam. Please have with you your original passport or European Resident's ID Card in hand. All guests must attend the Mandatory FULL guest immigration inspection in the cruise terminal ashore whether you are going to visit the city or not. We kindly as you to make your way to the gangway once the final call for all remaining guests has been announced. Please listen carefully to public announcements and they can also be heard in your stateroom by tuning to Channel 11. Please have your proof of citizenship (passports or EU resident's ID card) ready for Immigration Inspection. You will be able to return to the ship as soon as the process is completed. 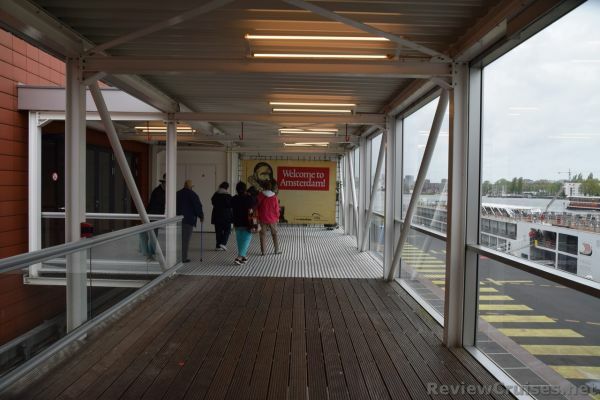 Amsterdam Cruise Terminal has a waiting area, cafe, wi-fi and other facilities at your disposal. Thank you for bearing with us through these important procedures. If you are participating on a morning NCL shore Excursion please meet and additional 15 minutes before the time on your ticket at the Stardust Theater. EU Immigration will take place as you enter the Stardust Theater on Deck 7 on the Starboard side of the ship - this is the only entrance that will be open. All guests on NCL Shore Excursions will be seen by EU Immigration officers prior to going ashore.